[This post is from Maikel, who has come up with a new way of using and viewing the information we are collecting]. The voyage of HMS Birmingham (showing a few position errors) as seen in Journey Plotter. Having been active as an Old Weather transcriber and in editing the transcribed logs for display on Naval-History.Net, I started to be curious about the journeys of the Royal Naval ships. Giving in to this form of Old Weather addiction, I started to create an application that could retrieve the position information for the vessels I had edited. Seeing the dry numbers being transformed into a 2-dimensional voyage on a map was such a satisfying experience, I just had to share it with others. 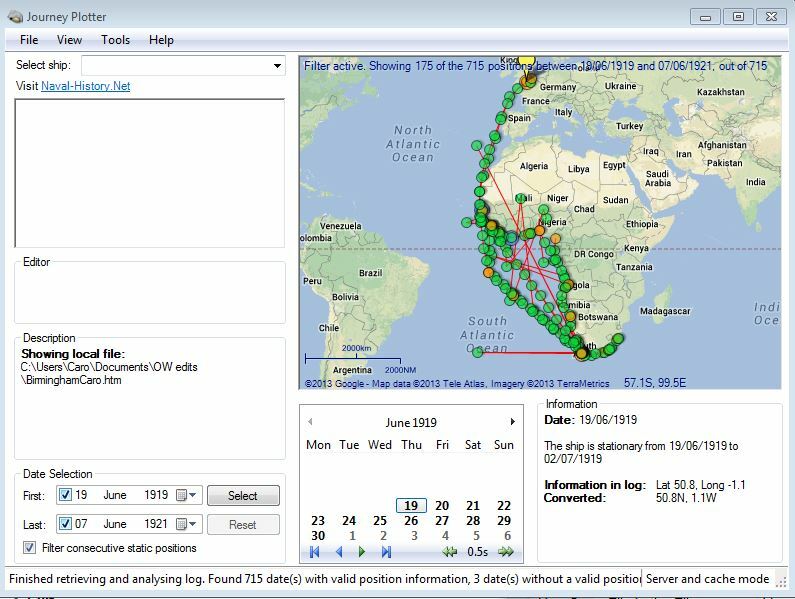 This resulted in Journey Plotter, a Windows application for plotting the journeys, or parts thereof, of Royal Navy ships from the World War 1 era. Journey Plotter makes use of data from original Royal Naval log-books that have been transcribed and edited by oldWeather volunteers, and then made available by Naval-History.Net. Journey Plotter also turned into a valuable tool for the log editors: Position mistakes of a vessel are easily overlooked if it’s just a number. Seeing a strange jump in a voyage makes it much easier to spot. If you are interested in Journey Plotter, visit http://journeyplotter.ihostfull.com to learn more about it. I trust you will enjoy looking at the journeys of the Royal Navy vessels and/or have a useful tool during the editing of their voyages. Images from Journey Plotter are now being used in some of the ship history files we’re producing: E.g. HMS Birmingham, HMS Una. I love this, except that it is a Windows application. I am a Mac user. The data are online and available to anybody, but We’re not yet at the point where it’s easy to write software that runs on all platforms. Any use of the data is good, it doesn’t have to be perfect: Maikel’s program is great for those with Windows – if anyone else would like to make something similar for Mac/iPad/android/linux/web/… that would be great too.